A bit like Sally Jean Cunningham's Great Garden Companions and Emma Cooper's Alternative Kitchen Garden, I found Michael Phillips' latest book, The Holistic Orchard, to be an intriguing read. My time farming and gardening still seems short in comparison to so many others I meet, but as the seasons roll by I find myself thinking more often that not, "There has to be more to this than what I see here." Phillips' book, like the other two mentioned above, works on filling in the details I crave while giving me sound advice and instruction on how to work in partnership with those forces to grow good fruit. With the exception of a potted blueberry, I don't grow fruit, but I still found plenty of good information there to apply to my vegetables. Take a look at my review over at Permaculture Magazine to get more of my thoughts on the book, and then pick up a copy. (And consider subscribing to Permaculture Magazine, too. Great stuff there!) Orchard or no orchard, you won't regret it. Photo Note: Taken during our trip last September to England. 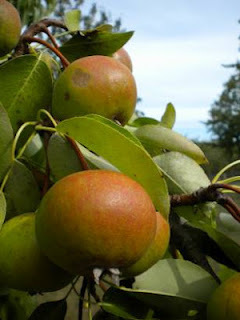 We took a day to help pick perry pears at Oliver's Cider after meeting them at the Ludlow Food Festival. What a glorious day it was to be out in real autumn again with friends new and old with a sip or two of perry at the end. what a great review of this book. I'll recommend it to my more 'green thumbed' friends and family- I TRY...but have gone through plants one after the other...the only thing that I seem to be able to do well with are orchids- not sure why that is- they appear to have a life of their own. Many thanks, Anjuli! It's a great book that effectively presents WHY natural and organic techniques work so well. I loved it!